Over many years I have set myself the task of photographing the quickly disappearing Chapels of Wales. I started work in 2011 in earnest on a photographic essay and I was put in touch with a publisher who was prepared to print and distribute the book. 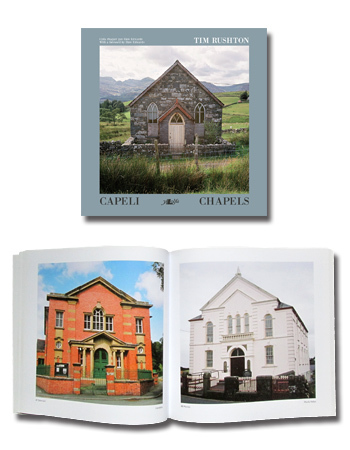 Having collected negatives on a medium format camera for many years, the resulting book, Capeli/Chapels, was finally published in June 2012 with a bi-lingual Welsh/English text. It features 120 photographs of the architectural diversity of Welsh Chapel buildings as a typological study and is published by Y Lolfa, a Welsh printing company. "Those who are enthused by the simple but profound and precise observations of Bernd and Hilla Becher, the German couple who photographed industrial architecture, will appreciate a new book called Chapels by Tim Rushton… Good photographers make us look about us and make us see more than we would otherwise."